Save hundreds of hours over the course of the school year with Magic Grading. Magic Grading includes instant visual feedback that helps students develop as independent problem-solvers and debug their own code. Once their activities are submitted, you control what and how much you grade. Save time grading with instant feedback capabilities on all CodeHS problems. Every program and exercise on CodeHS is run through our instant feedback system to provide students with instant visual feedback to help them debug and develop critical problem-solving skills. With the instant feedback system student programs should already be in a functional state when you look at it, allowing you to focus more on reviewing for code style rather than functionality. Focus on only reviewing the problems that are most relevant to you and your students. You start out with only a few problems in your queue to give you the freedom to choose what you want to grade. Add to Queue:As you browse through student progress you'll have the ability to manually add open submissions for specific problems into your queue. Queue Settings:Already know what's important to you? Setup your grading queue ahead of time by automatically sending submissions for specific problems as they come in. Streamline your grading with CodeHS teacher tools that make grading easy and efficient. Gone are the days of copy and pasting code into emails that must be sent, received, opened, and run using a local code editor. Teachers can sign on to CodeHS and easily view, run, grade, and provide feedback on the program all in one place--through the CodeHS site. Students receive a notification when teachers are done grading student work. Our specific grading tools help teachers optimize their grading routine and be most efficient when it comes to grading lots of student work. Grade Mode:View and run each student program that has been submitted. Grading can be done through the "Help" tab in the top right of the page. Access sample solutions by clicking on the "More" tab in the right window, and then "Solutions". Each time you grade/leave feedback for students, you'll automatically be taken to the next program in your grading queue. 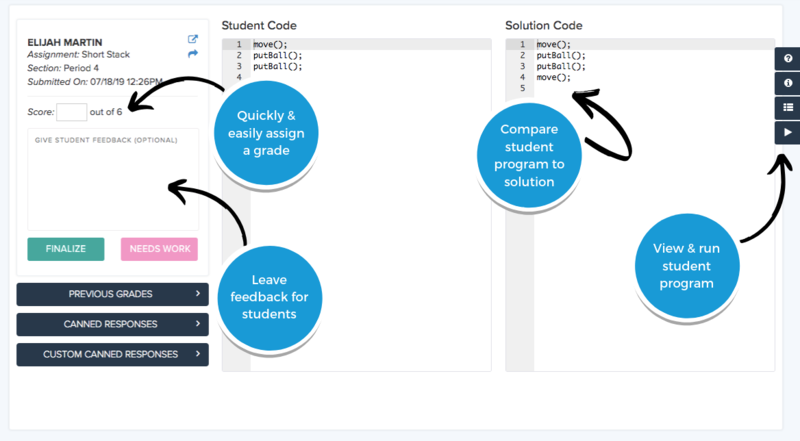 Fast Grade:Fast Grade will allow you to look at students' code and compare it side-by-side to sample solutions without actually running the programs. This is ideal for super quick and efficient grading, in which the auto-grader has already assessed a program's functionality. Submission Feed: The submission feed allows you to keep up to date on what your students have been working on. You can view the most recent submissions from your students and see basic information on what problems were completed and when. 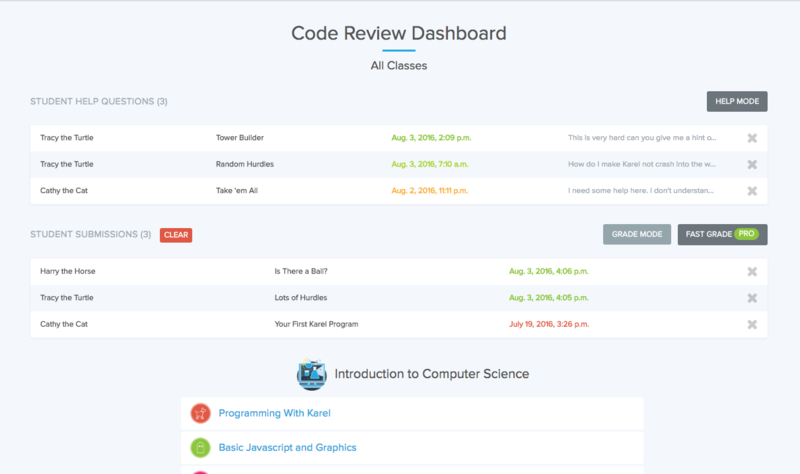 Code Review Dashboard:Get started grading and reviewing your students’ programs from the Code Review Dashboard. Here you will find a list of help questions and submissions to be graded from your students. You can view questions and submissions from all your students or you can view them for just one of your classes. Also from the Code Review Dashboard you will have quick access to grading tools, like Grade Mode and Fast Grade, and also to edit your queue settings.